Hey, I’m back! Had a nice little break there and now I’m back in full force (though I’ve been active in the comments and in posting blogs), ready to provide the regular dose of inanity for you to skip over on your way down to the comments. Today’s strip is a reveal I’ve been looking forward to for a long, long time. It follows up directly on something Sam said during the invasion (major kudos if you can figure out which strip that was) and is a big signpost towards what I’m hoping to say with Sam’s character. Good stuff, and ably rendered and designed by Mr. Marc Lapierre–who did a great job filling in for me while I was gone. Don’t forget: SuperFogeys Origins is back! You can see the latest page here, or you start “Spy Gal – Captured,” the direct sequel to Spy Gal’s origin right here. You’re gonna need to source that! Curses. It doesn’t straight up say he was born in America, because it could be that his American parents were visiting another country. All we know is that he wasn’t born in the Soviet Union. That’s true, there is some wiggle room in the way the story is told. Thankfully, this issue is addressed head on on Wednesday. The white outfit is a good idea because it looks good on her. Duh. I could not agree more. One of Marc’s best redesigns. I know. It makes me sad, too. What good is being President if he can’t get a hat? I guess means ‘Soviet Sam’ is now ‘Uncle Sam’. And JUST when our Russian friends were getting into SF. Ding, ding, ding! All the kudos are yours, sir. Nice work. So in this version he never stopped being a villain huh. Something something George Bush. I think your politics is showing. Not quite a shocker for people paying attention, but a good direction I think. Did you know that alternate history practically has become it’s own sub genre? This could be almost as fascinating as if I had ever existed in the first place. Yeah, I’m admit I’m a huge sucker for alternate universes. In fact, I’ve got a whole other comic idea that is all about parallel universes in a way I’ve never seen before. I hope to one day get to use it. The alternate history of Earth-Avalon and how and why the two worlds are different will clear by the end of this chapter. You can probably already guess at least one major points of deviation. There are a few others. Oddly the first guess that comes to mind is that there is no “Jerry” in Avalon. How ya’ gonna explain the 4/5 finger diversion?! Wow, and when you really think about it…you had to,see this coming considering Sam’s nature in the strips so far. That you can say that makes me very happy. I hate it when Alt universe stuff is just the opposite of what we’re familiar with with no rhyme or reason to it. This should feel logical to a certain extent or it just doesn’t work. She just can’t wear that outfitt after Labor Day. Heh. Someone’s been reading the tags. I knew that cover was a great idea! Indeed it was, sir! You just didn’t know how good. Sam is the president?! Awesome! I’d totally vote for him! Hey, everybody. 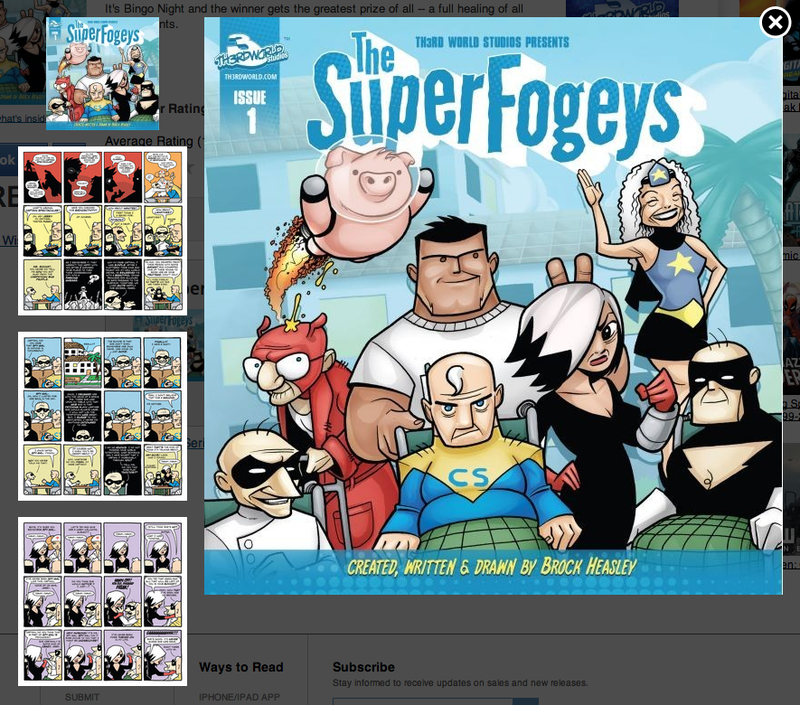 I’m really, REALLY excited about this news–SuperFogeys just launched on the premiere digital comics store Comixology! 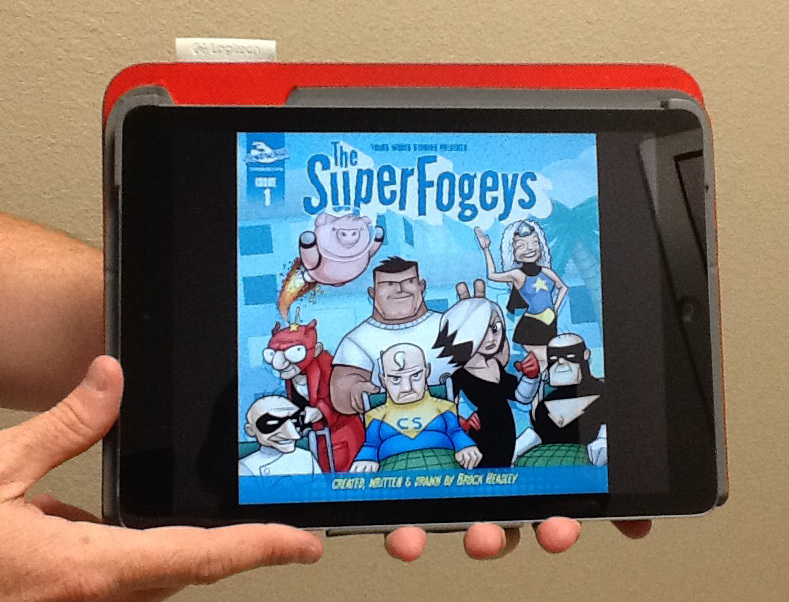 SuperFogeys has been available digitally on mobile before, but, unfortunately, the quality of the presentation just wasn’t there. Comixology, however, provides the very best digital presentation possible. These are high resolution pages–much higher than you’ll find on this site–and they can be read from your computer or laptop, iPhone/iPad, Android, Kindle Fire or Windows 8. This is the purest way to read SF, hands down. Comixology also features guided view, which takes you panel by panel. It’s not exactly how SF was intended to be read, but I have to admit I love the completely different feel it gives the story. Think of it as a slightly more cinematic experience. The first issue includes Chapters 1 and 2 and is available right now for free. All you need to do is a quick sign up on Comixology if you don’t have an account already. Issue 2 is also available for $1.99 and contains Chapters 3 and 4. More issues coming, very, very soon. Our goal to put everything out on Comixology, right on through the most current stuff. Now, you gotta know this puts us in the same store as the big dogs–DC, Marvel, Image, Dark Horse, BOOM!, etc. 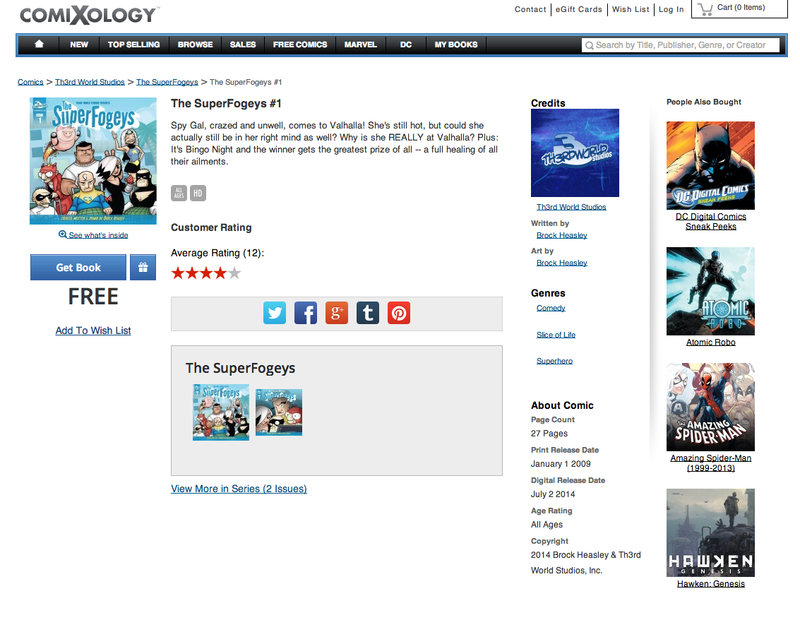 SuperFogeys is gonna live or die on how well it’s rated. If you agree SF is good stuff (and if you’re reading this, I kind of assume you do), please consider making your feelings known by giving the books a 5-star rating. Tell the world what you already know: superheroes CAN grow and change and even get older–and it’s cool.